Based out of Sioux Center, Iowa, Interstates offers electrical construction, electrical engineering, and control systems services. They meet the electrical and automation needs of companies all around the world. With many business units competing for attention on a single website, it is important for visitors to easily navigate and understand all of the services offered, in addition to providing clear calls to action and conversion points. 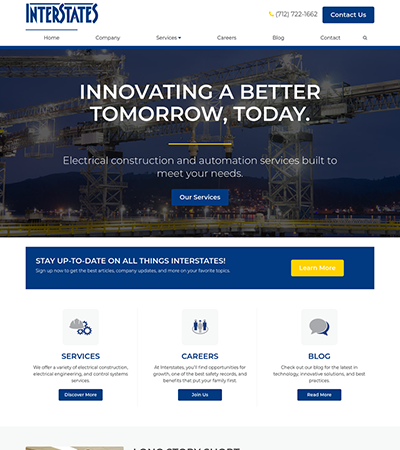 Folsom worked with Interstates to create a captivating website with several custom features that were designed to help maximize communication while reducing the overhead of managing the website. Folsom also manages several high performing Google Adwords campaigns that are design to increase traffic and leads through search and display advertising channels. These advertising efforts largely focus on recruiting, with the goal of attracting new talent to the company.